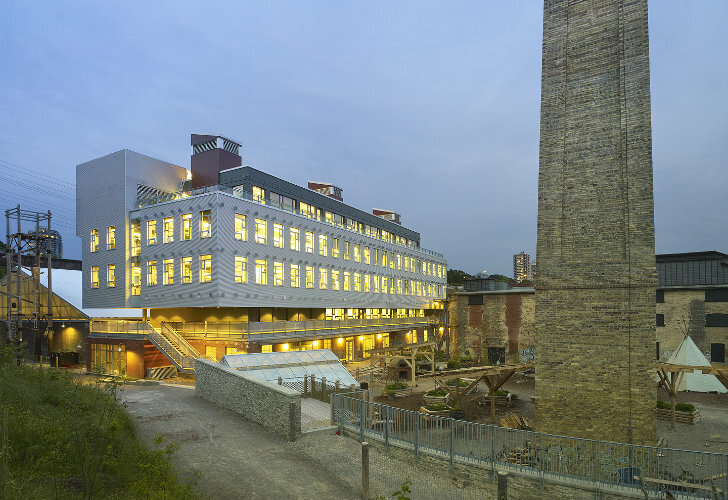 What was once a brick factory in Toronto is now the headquarters for the Evergreen Foundation and a thriving hub for nature, education, and culture. 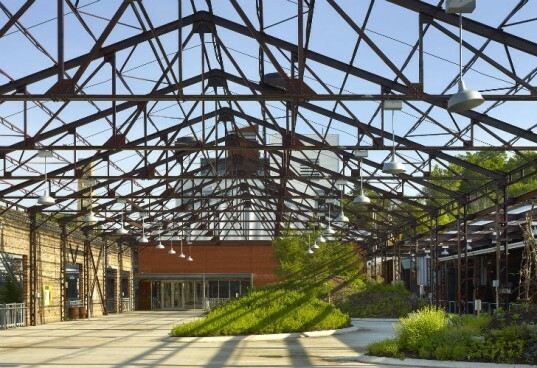 The green renovation project called Evergreen Brick Works was led by Diamond Schmitt Architects and resulted in new facilities for the organization and a rehabilitated brownfield in Toronto's Don Valley. They also constructed a new LEED Platinum-designed building called the Centre For Green Cities to house the admin, education and welcome center for the non-profit organization. The derelict brick factory in Toronto’s Don Valley has been adapted and rehabilitated into the Evergreen Brick Works project. It is now an environmentally-based community landmark to engage visitors in diverse experiences connected to nature and the city. To begin the project, Diamond Schmitt Architects had to remediate the brownfield by restoring the buildings, and cleaning up the hazardous materials and soil. Next up, they sought to protect the surrounding landscape and river with permeable paving, rainwater collection, new greenscapes, and natural filtration strategies. Out of the ruins of the former factory a new building was constructed, the Centre for Green Cities, which has become the flagship for the Evergreen Foundation. The LEED Platinum-designed building houses event spaces and classrooms on the ground floor, then more classrooms on the second floor and finally administrative offices on the top floor. To achieve LEED Platinum the design team focused on creating a high performance envelope to minimize energy loss. Both a green and white roof help insulate and reflect the sun respectively. In the future the facade will see additional moveable screens to accommodate planters and artwork that will also help reduce solar heat gain. A high efficiency mechanical system incorporates solar chimneys, natural cooling, heat recovery and radiant heating. Finally the project also includes solar photovoltaic panels, rainwater collection, along with energy efficient lights and water fixtures. The Brick Works project now includes educational programs for children and adults, a farmers’ market, a plant nursery, an adjoining park and wildlife habitat, an open-air industrial museum, and offices for Evergreen and like-minded organizations. Recently the project was awarded a PUG Award in the commercial building category. The derelict brick factory in Toronto's Don Valley has been adapted and rehabilitated into the Evergreen Brick Works project. It is now an environmentally-based community landmark to engage visitors in diverse experiences connected to nature and the city. To begin the project, Diamond Schmitt Architects had to remediate the brownfield by restoring the buildings, and cleaning up the hazardous materials and soil. The Centre for Green Cities is designed as a place to view the landscape. There are stairs, wrap-around balconies, and roof terraces from which to survey the Brickworks site, the Weston Gardens, the Don River Valley and the city's horizon. Seen here is the second floor balcony, with patterned handrails and dark cor-ten ceiling. Next up, they sought to protect the surrounding landscape and river with permeable paving, rainwater collection, new greenscapes, and natural filtration strategies. Out of the ruins of the former factory a new building was construction, the Centre for Green Cities, which has become the flagship for the Evergreen Foundation. The LEED Platinum-designed building houses event spaces and classrooms on the ground floor, then more classrooms on the second floor and finally administrative offices on the top floor. To achieve LEED Platinum the design team focussed on creating a high performance envelope to minimize energy loss. Both a green and white roof help insulate and reflect the sun respectively. In the future the facade will see additional moveable screens to accommodate planters and artwork that will also help reduce solar heat gain. A high efficiency mechanical system incorporates solar chimneys, natural cooling, heat recovery and radiant heating. Finally the project also includes solar photovoltaic panels, rainwater collection, along with energy efficient lights and water fixtures.